When it comes to the World Cup, there’s only one thing more beautiful than the beautiful game itself, and that’s the opening ceremony. Before all eyes turn to Luis Suarez and Cristiano Ronaldo at the 2018 World Cup finals in Russia, we’ll be transfixed by the opening extravaganza at Moscow’s Luzhniki Stadium ahead of the opening game between the hosts and Saudi Arabia. We know that the Fresh Prince himself, Will Smith, will be performing the official song of the tournament at the ceremony. But there’s always more than just a few celebrities having a warble – there’s sure to be some show-stopping, eye-catching tech on display too. Remember when Tupac rocked Coachella – 16 years after his death? That was thanks to the fantastic resurrection of a little-known magic trick called 'Pepper's Ghost', revamped, recharged and rebranded as a modern day hologram. It saw a projection of the dearly departed gangster rapper projected down onto a reflective surface and bounced onto a foil screen at an angle so that the image of Tupac could be seen, but not the screen itself. Wouldn't it be fantastic to do something similar with history's greatest football stars, in the prime of their careers? Pele showing off his silky skills as a young Brazilian whizz kid, Zinedine Zidane before he was remembered for just that headbutt, Maradona using his fancy footwork instead of his sneaky hands? It'd be magical. While robots are supposedly about to take over all manner of jobs, professional footballers can rest easy for a few years yet based on what we’ve seen of droids’ attempts to master the beautiful game. 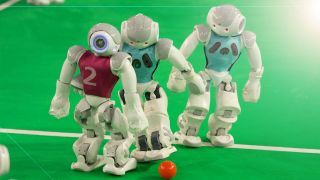 However, they’re getting better all the time, and including a demonstration of robot soccer at the opening ceremony could help footie-mad youngsters to engage with science. Okay maybe not, but it’d be cool. Robots have even got the hang of penalty shoot-outs – and they certainly couldn’t do any worse than Diana Ross, whose botched spot-kick at the 1994 World Cup in the United States remains to this day the most epic fail of that or any other opening ceremony. Since Pokemon Go blew up and we were all racing around our neighbourhoods hunting down Pikachus and Charizards, the world has become far more comfortable with the everyday use of augmented reality. AR technologies use a screen and camera in tandem (often using a smartphone, but likely to be increasingly found in spectacles) to overlay information onto the real-world scene in front of your eyes. There’s nothing more fun at a football match than a massive pitch invasion – but that gets a little bit tougher under the watchful eyes of a World Cup ceremony security team. So what about the world’s biggest virtual pitch invasion, through an augmented reality lens? Each fan in the stadium could take a photo and upload an avatar, and watch their digitised selves charge out onto the pitch, free from the burly arms of the Russian security squads. All the madness, none of the bruises. However, football pitches are notoriously bad for mobile coverage, what with all the concentrated connections being made, the interference from TV broadcast tech and the faraday cage-like designs of some locations. This may be one to hold off on until super-fast, super stable 5G connectivity becomes the standard. We’ve been promised them for years now, but the mighty jetpack has still yet to go mainstream. Taking flight via thrusters strapped to your back, the jetpack promises truly personal aviation travel – where the jetpack’s going, it doesn’t need roads. While you can’t yet walk down to your local jetpack dealership and fly off to sunnier climes, there have been many attempts to get people off the ground in this manner before. Perhaps most memorable of all was the flight of “Jetpack Man” at the 1984 Olympics opening ceremony in LA. Flying into the arena of the heads of the performing masses, Jetpack Man stole the show, leaving many (and by many, we mean members of the TechRadar team old enough to remember the occasion) clamouring for jetpack racing to become an official Olympic sport. Could Jetpack Man make a return for the Russian tournament? Unlikely, sure. But the jetpack’s commercial development continues to take strange and exciting turns, like this real-like Tony Stark, with a flight-enabled Iron Man suit that includes stabilisers in its hands. From Sputnik to the first artificial heart transplant, Russia has been a hotbed of innovation over the years, leading the way in the space race of the 1950s and 1960s and continuing today as a major security and services innovator. And… it was also the birthplace of a) the greatest video game of all time, Tetris, and b) the craziest musical instrument of all time, the theremin. If we at TechRadar had our way, the climax of the ceremony would see a giant game of real Tetris, blocks dropped from the sky, soundtracked by Putin himself playing the classic theme tune on a theremin. Let the games begin!